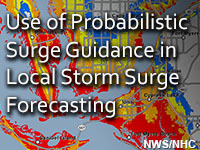 This lesson introduces forecasters to the probabilistic storm surge guidance used by the National Weather Service to assess local surge threats and impacts. It will provide practice in determining the chance that critical surge thresholds may be reached or exceeded and when this is most likely to occur. Developing an appropriate message for decision-makers and the public that includes potential surge values, threats, and impacts information is also explored. We strongly recommend reviewing the “Introduction to Tropical Cyclone Storm Surge”, “Forecasting Tropical Cyclone Storm Surge”, and “Storm Surge and Datums” before beginning this lesson. Without these prerequisites, learners may find this lesson very challenging. This online lesson is part of the Tropical Cyclone Storm Surge: Forecasting and Communication course. This is a great module! I would recommend it to anyone who is interested in storm surge guidance. I think this module would be even better with audio. Determine the potential TC storm surge impacts upon the local area of responsibility of a WFO, and derive an appropriate storm surge message. Determine the chance that critical storm surge/inundation thresholds will be met or exceeded. Determine when those thresholds are most likely to be met or exceeded. Given the expressed risk tolerance of an emergency manager (EM), determine the potential storm surge/inundation values for which decisions and subsequent preparations should be made. Summarize the information that you will share with the EM covering the forecast relative to stated critical thresholds, the threat to life and property, and potential impacts. Proactively coordinate with forecasters in other offices to ensure that a consistent message is created and communicated to the public.